I got into an interesting conversation about a week ago with a former student I taught a couple of years back. I was sitting at one end of the coffee shop while he was sitting by the fire-place reading a fiction thriller drinking his $5.00 coffee. Ironically this former student was quite the challenge for me when I was his teacher. At the time I was teaching health and he had been the only senior in my freshman health class. This wasn’t his first go around and I just knew he had to pass in order to graduate. He was an extremely intelligent teenager that challenged everything. He barely passed my class due to in-completes, absences and missing assignments but squeaked by because he was a great test taker. This student was certainly unforgettable. So when I saw him at the coffee shop reading I was impressed and excited to talk to him. I sat down across from him and just started asking questions; I really wanted to know how he was doing. It was a very frustrating conversation but another reminder of how important it is for we the people to start educating the population about community and freedom. I went to my trunk and handed this former student of mine the best seller by Orrin Woodward and Oliver DeMille titled Leadershift with a business card for a bookmark and encouraged him to read this fiction book instead. I can’t blame him for his naive thinking. He has spent the last 19 years of his life witnessing the results of a nation who has taken freedom for granted and was swept up into the belief system that the government (or someone else) will always have your back. This conversation inspired me to write this post. 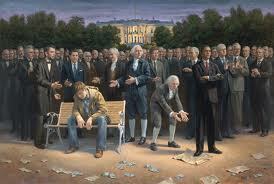 I recently found this controversial picture painted by Jon McNaughton titled, “The Forgotten Man.” (video below) The painting depicts all of the American Presidents, both past and present, standing in front of the White House and on a bench in the corner sits a dejected and impoverished man who represents the men and women that the Presidents have ‘forgotten’ in their quest for power. But the real controversial part of the painting? 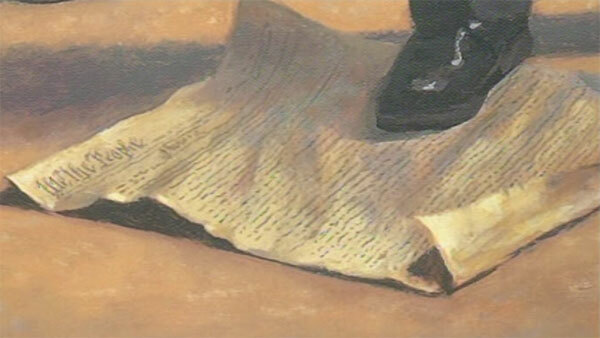 Underneath the foot of our current president is the crumpled Constitution of the United States. Now, I’m sure that some of you would object to something so outlandish and over-the-top. But, is the symbolic message of the painting that far off? Men and women trample and disregard the American Constitution every day as they pursue power and security instead of community and freedom. People forget that this pursuit encourages the design of more programs and initiatives to strengthen the power of the government. There is ample evidence of this when we see overwhelming government expansion, welfare programs, income taxes, the Patriot Act and ObamaCare. When governments gain more power, they do so by displacing the power of the people. The more powerful governments become, the less freedom people have. It’s that simple. In 1776, after witnessing the abuses of a large and out of control government, our Founding Fathers decided to create a government of limited powers, a government that gave political power to the people. A major champion of America’s freedoms came from the American Constitution: a document defining a government of limited powers; a government that derives its power from the people; and a people that have greater freedom as a result. Furthermore, the Constitution promotes and protects the rights of religion, speech, press, assembly and petition. This concept is not complicated. We (the people) need to take matters into our own hands. As people continue to pursue power and security instead of community and freedom, they trample the American Constitution. I think that Jon McNaughton’s symbolic painting of “The Forgotten Man” is a powerful warning for those who pursue more governmental power at the expense of the people. Is freedom worth it? Is the next generation worth it? That’s only for you to decide. Check out the book, Leadershift by Orrin Woodward and Oliver DeMille to begin the process of educating yourself on what you can do to play your part.